Canon Llevule is a Dunmer canon of the Tribunal Temple. You must aid him in speaking to his ancestor on behalf of Vivec during the quest Divine Conundrum. Llevule also helps you stabilize Vivec during Divine Disaster, stopping him from dying and the city from being destroyed. In return, Vivec names him the new Archcanon in Divine Blessings. Llevule can only be found after Divine Conundrum has been started. 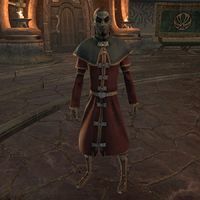 For that quest, he will be at Andrano Ancestral Tomb; for all other quests in Vivec's Divine Power questline, he will be found in Vivec's Palace or the Archcanon's Office. After Divine Blessings, he can be found in the Archcanon's Office, and, if talked to, will tell you he never realized how much work an archcanon has to do. "Did Canon Valasa send you? She did, didn't she! That means she made it to Seyda Neen. Vivec be praised! Will you help me complete my mission? It would be sacrilege if I don't enter my family's tomb and make Lord Vivec's inquiries." I'll help you enter the tomb and ask your questions. "As the Saints declare, the Tribunal always provides. We'll need to be cautious, however. Daedra invaded the tomb. Makes it hard to talk to one's ancestors while monsters try to eat you! I'll also need your help when we reach the summoning chamber." "Take this scroll with Lord Vivec's inquiries. While I summon forth my ancestor's spirit and concentrate on maintaining the connection, you must ask the questions. He insists we use the exact phrasing. We can go inside when you're ready." I'd like to ask a few questions before we enter the tomb. "I've already lost precious time due to the Buoyant Armiger's wounds, but I suppose a few more moments won't make the volcano erupt or the moonlet fall from the sky or anything. What else can I tell you, my friend?" Why does Lord Vivec want you to contact your ancestor? "I'm not quite sure and it wasn't my place to ask. When your Living God gives you a task, you say, "yes, me lord!" The questions seem to involve the time before the Tribunal, which I assume is why we must ask them of my long-dead ancestor." Tell me about your ancestor. "Few of my contemporaries can boast of a luminary such as Farena Andrano occupying a prime branch upon their family tree. Lady Farena studied at the feet of Sotha Sil and was counted among his companions before the Tribunal rose to power." Sotha Sil is the architect of time and the binder of Oblivion. If you want to know more, we can talk after we've finished." Tell me about the creatures in the tomb. "Well, I can tell you why they weren't here the last time I paid my respects. Canon Valasa thinks they're some kind of Daedra, determined to keep us from fulfilling Lord Vivec's will. Until you showed up, I wasn't sure what I was going to do." I'm ready. Let's enter your family tomb./Never mind, let's head into the tomb./I'm ready. Let's enter the tomb. "Before we go in there and face those monsters, I want you to know how much I appreciate your aid in this matter. Just don't lose the scroll that contains Lord Vivec's questions. Now come! Let's call forth my ancestor. I'll open the tomb door." Canon Llevule: "Follow me! But keep an eye out for those daedra." Farena Andrano: Hasn't my rest been disturbed enough by those filthy Daedra? Why do you summon me, descendent? Canon Llevule: My Lord Vivec has inquiries that only you can answer, my lady. My companion will present them, with your permission. Fareno Andrano: The Warrior-Poet? Very well, ask Vivec's questions. Canon Llevule: "I hope that's what Lord Vivec needed. Let's talk outside." "Thank you for helping me complete my task. Now I need to return to Vivec City. Have you been there? It's amazing! Ziggurats rising out of the water, the moonlet hanging in the sky above. You should meet me there so I can introduce you to Lord Vivec." Did you understand what your ancestor told us? "Just between us, I understood neither the questions asked nor the answers received. Not that I expected to. Some things aren't meant for mortal minds. That's another reason for you to come to Vivec City, to help me explain what my ancestor said." "Excellent! I just need to make a quick stop in Seyda Neen to check on my original traveling companions. When you get to Vivec City, head right to the palace and I'll meet you there. I know that Lord Vivec will want to reward you for assisting me." You said I could ask you more about the Tribunal after we finished your mission. "Of course! As I said, the Tribunal consists of our three Living Gods—Vivec, Almalexia, and Sotha Sil. They lead us in spiritual matters and rule over Dunmer society as God-monarchs of the Dark Elves. I serve Vivec, but honor the entire Tribunal." Do all Dark Elves follow the Tribunal? "Unfortunately, no. The Dunmer Houses bow to the Tribunal, but the savage Ashlanders refuse to acknowledge their divinity. The heretics never allowed themselves to be assimilated into the Great Houses. Instead, they hold to primitive superstitions." "You should really talk to the Archcanon. He knows much more about Lord Vivec's... situation... than I do." After Divine Blessings, you can find him in the Archcanon's Office. "I don't think I'll ever get used to being the archcanon"
"Blessings of the Tribunal to you, my friend." "I never realized there was so much for an Archcanon to do. I really must study!" Llevule is the author of Faith in the Shadow of Red Mountain and Invitation to Morrowind. In The Elder Scrolls III: Morrowind, you are tasked with retrieving the Skull of Llevule Andrano from the Andrano Ancestral Tomb for an Orc necromancer as part of the Main Quest. This page was last modified on 1 March 2019, at 00:36.